The May 2018 English Music Festival featured a concert which, even more than ever, thrilled and delighted the packed audience in Dorchester Abbey. The concert was given by celebrated baritone Roderick Williams, the Bridge Quartet and pianist Michael Dussek, and one of the works they presented to tremendous acclaim was Ivor Gurney’s ‘The Western Playland’. A few weeks later, we took this work into the recording studio at Potton Hall with the same artists: the sessions also included the world première recording of Gurney’s String Quartet in D minor of 1925 (a rare survivor among Gurney string quartets), as well as songs by Gurney and Howells (including the wonderful ‘King David’). We are now seeking funding to help us to meet the remaining high costs of the editing, mastering, booklet production and manufacture of the disc. Can you help us to make this glorious music disc available? If so, please visit our subscription page and sign up, in return for a number of benefits. On Thursday 20th December at 6.30p.m. at the 1901 Arts Club in London, we will be launching two EM Records discs: our long-awaited triple-disc set of the complete music for violin and piano by Sir Hubert Parry (‘The Wanderer’), and our recently-released disc of Parry songs by Jeremy Huw Williams and Paula Fan (‘With Harmony of Soul & Song’). The launch will comprise a recital and short talks, as well as an opportunity for socialising. For more information or to book tickets (priced £20 each) please visit our Events page. We are delighted to have a plethora of new releases for listeners to explore. 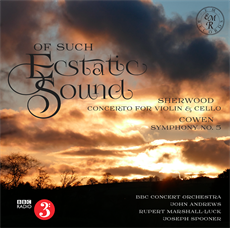 These range from our best-selling recording of Sherwood’s magnificently tuneful and exuberant Concerto for Violin and Cello and Cowen’s Fifth Symphony with the BBC Concert Orchestra (as heard on BBC Radio 3), through unusual and captivating music for harp by Paul Lewis, Parry songs from baritone Jeremy Huw Williams and pianist Paula Fan, to choral music by Holst and Dyson. Our latest release is ‘Radiance’: a disc of searingly gorgeous choral works by regular EM Records composer Paul Carr, as well as by Eric Whitacre, Bob Chilcott, Ola Gjeilo and Morten Lauridsen. Please enjoy exploring our online catalogue to find out more about these and the other rarities available on the label. Each of our recordings has a dedicated page with artist details and a full track listing; and all titles are available to purchase through our newly-refurbished online shop. We have many more exciting discs planned for release over the coming months, including our triple-disc set ‘The Wanderer’, comprising the complete music for violin and piano by Sir Hubert Parry. This will be followed by ‘The God Marduk’ – music for violin, viola and piano by Andrew Downes; ‘Eroica’ – virtuosic music for solo violin by Elgar, Tovey and Albert Sammons; a disc of songs by Parry, William Sterndale Bennett and Walter Battison Haynes; choral and orchestra music by John Gardner; a disc of solo violin works by Graham Whettam; and the DVD of our Richard III Commissions. Are you one of our regular supporters, and do you tend to purchase many of our discs? If so, why not sign up as a Foundation Subscriber to EM Records? Foundation Subscribers receive a number of benefits, such as having EM Records discs delivered direct to their door immediately upon release, receiving a pair of free tickets to all EM Records launches and events, and receiving all the benefits due to individual disc subscribers. In return, Foundation Subscribers provide much-needed regular annual income to EM Records, which allows us to plan more securely for the future, as well as the moral support that is important to a small label such as ourselves. A Foundation Subsription costs £120 per year. Visit our online shop to sign up!